Are you having difficulty discerning or receiving this "new revelation"? Then perhaps you have been interpreting your Bible in the "old way" -- comparing Scripture with Scripture, studying diligently to account for every jot and tittle and being careful to rightly divide the Word of truth. If this describes you, then you belong to the "Old Generation" which will not enter in to "possess the land" in the Latter Rain Revival. You may even be a member of a denominational church with its dogmatic confession of faith and statement of doctrine. These legalistic forms will be relics of the past in the up and coming "Postdenominational Church." Paul Cain advises that you "dump all that carnal stuff" (doctrine) and listen to what the "spirit" is saying to the churches through the Latter Rain Prophets and Apostles, who are dispensing many "new, sacred truths." Now, back to your Bible study. In your Bible you will want to change the book of "The Revelation of Jesus Christ" to "The Manifestation of the Sons of God." That’s right, we are not to be looking for the "coming of our Lord Jesus Christ and our gathering unto Him." Nope. That would be an "escapist mentality" to be repented of at once if we would be Overcomers. Instead, we should be looking forward to the glorification of the Corporate Church, which will become perfect and immortal here on earth before the Second Coming. In fact, as Jesus comes "spiritually and invisibly" to His Church, He will actually "incarnate" the Corporate Body and reveal Himself to the world through miraculous signs and wonders performed by the "Manifest Sons of God." This great end-time Company is really the "Manchild" of Revelation 12 which will rule the nations with a rod of iron. (You will need to replace Israel with the Church in this passage.) Yes, this end-time Church is also the prophetic fulfillment of the dreadful army in Joel 2, which is God’s agent of judgment to cleanse the earth of evil during the "times of restitution." (You will find this army also in Revelation 9!) Since the Manifest Sons of God are "the Christ," they will be putting all things under their (oops!) His feet, including the "old order" brethren. Those who would be chosen as the elect Manifest Sons of God by the modern Apostles and Prophets, must first repent of their old divisive attitude of separation from error. Christ cannot incarnate a divided church and for this reason we will need to be delivered from our narrow doctrinal point of view and join the ecumenical crowd on the Broad Way. It matters not that the blood of the martyrs was shed contending for the faith that was once delivered to the saints. Those who persist in being contentious about doctrine may join them when the great "revival" arrives circa A.D. 2000. Over 50 years ago, William Branham, George Warnock, Paul Cain and others attempted to introduce Latter Rain/Manifest Sons of God teachings into the Pentecostal movement. In 1949, however, the Assemblies of God officially rejected the Latter Rain/ Manifest Sons of God doctrine as "heresy." The cult went underground but surfaced again in the 1960’s as the Manchild Company. Disregarding the Assemblies of God decision, Paul Cain, the Kansas City Prophets and Vineyard Ministries have subsequently reintroduced and successfully established this false doctrine in the Pentecostal churches. Today, few recall the controversy surrounding Latter Rain/Manifest Sons of God doctrines fifty years ago and their repudiation by the Church. Of necessity, they are now camouflaged and Christians must have an accurate understanding of Scripture to discern these counterfeit winds of doctrine. Charismatic churches are well-established in Latter Rain doctrine and Evangelical churches are currently being indoctrinated via numerous parachurch organizations and movements. Latter Rain teachings include: Kingdom Now/Dominion Theology, Progressive Revelation, Revival/Harvest, Joel’s Army, Replacement Theology, Post-Millennial Eschatology, Signs and Wonders, Territorial Warfare, Ecumenism, Restoration of Apostles and Prophets, Jubilee/Feast of Tabernacles, and the Post-denominational Church. Thus, whole congregations are bewitched with the prospect of unleashing their potential as ‘Godmen’ in the approaching "Latter Rain Revival." This predicted restoration is an outgrowth of Replacement Theology which appropriates to the Church the promises of restoration which God gave to Israel, specifically Joel 2:23 and Hosea 6:3. James 5:7 simply states that the Church must patiently wait for the coming of the Lord as the husbandman waits for the "latter rain" to receive the full harvest. The saints will then reign with Christ, as seen in Revelation 19. Neither Daniel, Matthew 24, Thessalonians nor Revelation mention a great Christian revival, but characterize the period before the Second Coming as a perilous time of great deception, paganism, apostasy from the faith and persecution of the saints. "Rev. Ernest Ramsey, an associate pastor at Unity's Kansas City's Founder's Church, Unity on the Plaza, is an enthusiastic follower of the Alice Bailey and Benjamin Creme teachings. In his Research Report #2, he tells of something he was led to by a spirit guide - what he terms 'Neo-Pentecostalism.' An aberrant branch of Pentecostalism, this is more commonly known as the 'Manifest Sons of God.' That movement is also referred to as 'Sonship' or 'Overcomers.' Ramsey concludes based on even less evidence than I have personally collected that this is part of the New Age Movement. "Ramsey's work for his organization, 'Synthesis Fellowship,' first came to my attention in early 1983. His major report, entitled "An Evolutionary Basis For The Reappearance of the Christ and his Executives, the Masters of Wisdom" was inspired by Benjamin Creme's appearance and speech at Unity on the Plaza in Kansas City, Missouri. . . The most interesting section of Ramsey's report dealt with 'Neo-Pentecostalism.' Ramsey spent a semester at one of the Neo-Pentecostal or Manifest Sons of God seminaries (in upstate New York). . . Already familiar with the Alice Bailey writings, he was amazed to see that there was a branch of Pentecostalism that embraced the same teachings -- albeit using sometimes different terminology. Other prominent New Age leaders have openly expressed the intention of their movement to infiltrate the Christian Church in order to introduce their esoteric teachings and to "draw away disciples after themselves." In The Unfinished Animal: The Aquarian Frontier and the Evolution of Consciousness, Theodore Rosak revealed that, "Charismatic congregations in main-line churches are entry points into the Aquarian frontier. "(11) Alice Bailey, Theosophist and mother of the modern New Age Movement, revealed an ingenious plan in her 1957 volume, The Externalisation of the Hierarchy. Cabalist agents would infiltrate the Christian Church to modify its message, while adapting it as a vehicle for the Universal Religion of the 21st Century. In Latter Rain doctrine, paramount emphasis is placed on the proposed Year of Jubilee A.D. 2000, when all nations and a "united" Church will celebrate the Feast of Tabernacles. The prophetic fulfillment of this Feast is said to occur prior to the return of Christ. Latter Rain prophets claim that this will also be a "Second Pentecost," since the first was ‘incomplete.’ Christ will then appear in the midst of His people and be incarnated in his Body, filling the Corporate "Christ" with His glory, which will then be poured out on all flesh. This Latter Rain "Second Pentecost" during Tabernacles is suggestive of the "Planetary Pentecost" preached by Barbara Marx Hubbard as the peaceful "alternative to Armageddon." At this time, a "quantum leap" in the evolution of mankind will occur as revealed to her by "the Christ": "At the moment of cosmic contact, I will appear to you both through inner experience and through external communication on your mass media." Says Ms. Hubbard, it will be a time when "the divisions of the religions would be over…We would each know that God is within us…If all who feel we are connected to each other, to nature and to God join in a planetary Pentecost, we shall be transformed in this lifetime. I believe in the peaceful second Coming. "(14) Earnest Ramsey perceived virtually no difference at all between the New Age Tabernacles/Year of Jubilee and the Latter Rain interpretation of these celebrations. Coincidental with the Latter Rain/New Age agenda to celebrate Tabernacles in the proposed Year of Jubilee, the Vatican Central Committee is coordinating with other Catholic Rites and church conferences, such as Episcopal, Anglican Communion, World Lutheran Federation, World Reformed Alliance, Methodist World Council, the World Council of Churches for a celebration of the Great Jubilee "which will take place simultaneously in the Holy Land, in Rome and in the local Churches throughout the world. "(16) In ancient Israel, the 50 year Jubilee celebration freed all slaves, canceled all debts, and restored properties to the original owners. Pope John Paul II, New Age/New World Order planners and Pat Robertson (17) of the Christian Broadcasting Network have all called for the worldwide redistribution of wealth and cancellation of debt in 2000 A.D.--severe measures that would precipitate the collapse of secular economies which have not planned for this adjustment. Zechariah 14:16 states that the nations will go to Jerusalem annually to worship the King and to keep the Feast of Tabernacles, after the return of Jesus Christ. Which "Christ" will the Latter Rain prophets worship? To defend their unbiblical exposition of many doctrines, Latter Rain prophets and apostles claim that "new" teachings, prophecies and interpretations of Scripture are progressively being unveiled which have heretofore not been revealed to the Church. Even though such visions, prophecies and revelations are unsupported by the Word of God, they are nonetheless canonized as doctrine because they were accompanied by spiritual experiences. However, Hebrews 1:1,2 states, "God who at sundry times and in divers manners spake in time past unto the fathers by the prophets, hath in these last days spoken unto us by his Son." Since Jesus Christ is the Word of God, I Corinthians 14:29 contains the provision that all prophecy in the church be tested and judged by its conformity to Scripture. Isaiah 8:20 declares, "To the law and to the testimony: if they speak not according to this word, it is because there is no light in them." In 1993, Charismatic Pastor John Hinkle prophesied nationally that on Thursday, June 9, God would remove the evil from the earth. That this was a false prophecy should have been apparent to believers from the beginning, for Scripture is clear that evil will not only remain in the world, but will increase before Jesus Christ returns. Deuteronomy 18:22 states, "When a prophet speaketh in the name of the Lord, if the thing follow not, nor come to pass, that is the thing which the Lord hath not spoken, but the prophet hath spoken it presumptuously." False prophets in Israel were to be stoned. Mercifully, the church is to judge prophets and reject those who do not speak according to sound doctrine or whose word is not specifically fulfilled. However, Christian leaders did not reject Hinkle’s prophecy as false but dissembled, claiming that an earthquake in South America or unknown event in the invisible realm fulfilled its conditions. Could not the latter rationalization be made for all prophecies that default? "New" revelations extend beyond the parameters of God’s Word and give opportunity for false teachings to be introduced to the Church. The mischief that ensues from the acceptance of false prophecy is considerable. The transition from John Hinkle’s prophecy to Paul Crouch’s outrageous statement that Christians will soon remove the tares from the wheat was subtle. We have yet to see the damage that will result from Pat Robertson’s astonishing claim in a 1984 televised sermon that, "God spoke through a word of prophecy in May 1968, and said, ‘I have chosen you to usher in the coming of My Son.’"(20) Robertson also announced then that the Christian Broadcasting Network will provide worldwide coverage of the Second Coming of Jesus Christ from the Mount of Olives in Jerusalem. It is unlikely that Pat Robertson will televise the Lord Jesus Christ in His glorious return from heaven. Perchance it may be "that Wicked One, even him, whose coming is after the working of Satan with all power and signs and lying wonders." "These effects are identical to those which New Age writers have predicted during the appearance of Anti-Christ… (1) A loud sound will be heard world-wide which will herald the coming of Maitreya, the Christ. Prompted by this sound, people will be aware of his coming on three distinct levels: Spiritual, physical, and emotional. (Alice Bailey's The Externalisation Of The Hierarchy, p. 173.) (2) ‘...When Lord Maitreya appears, he will appear as different beings to different people… Thus, he will show that he is all things to all people.’ (Bill Lambert, speaking at Seminar, ‘Possible and Probable Events In The Future,’ Theosophical Society, Boston, Massachusetts, August 8, 1991). (3) His three-dimensional image will appear over all nations of the earth simultaneously. He will speak to each ethnic group in their own language. We know this is technologically possible with computer images via telecommunication satellite. (Constance Cumbey, Hidden Dangers Of The Rainbow, p. 24-25). True believers will meet the Lord "in the air" (not on earth) and He will return with them to earth, not as a "peacemaker," but to destroy the nations gathered at Armageddon. The unthinkable will become "religiously correct" when Evangelical and Charismatic shepherds lead an apostate Church in the worship of a false Christ. Revelation 13:15 further states that, "as many as would not worship the image of the beast should be killed." She and other New Age leaders have estimated "that for planetary transformation to take place, up to one quarter of the inhabitants of the earth will have to be excised like a cancer." Given the animosity that has been generated by Latter Rain prophets toward Biblical Christianity and the affinity of this movement for warfare terminology, it is hard to resist the suspicion that the New Age/Latter Rain regime will be using a militant Church to accomplish this. Prophet Rick Joyner has even identified "Antichrist" as the traditional Church (30) and Jack Deere claims that modern prophets will execute the Tribulation judgments. It would be unwise to nonchalantly dismiss these claims as idle braggadocio. Paul Cain, Bob Jones, Rick Joyner and other Latter Rain/Manifest Sons of God proponents have paranormal experiences on a regular basis and have demonstrated occult powers. 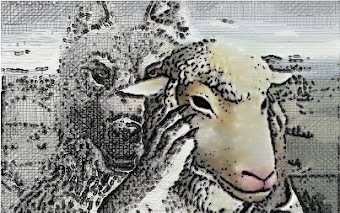 False prophets preach "another gospel," which is not the true Gospel of Jesus Christ. Vineyard scholar Jack Deere has even admitted that he is not sure of the true gospel. In an interview, Deere told Robert Dean of Biblical Perspectives, "I used to be like you…thinking the gospel was simply justification by faith. "(33) This spiritual advisor to John Wimber, late Director of Vineyard Ministries, added that the gospel would have to include works, such as healing and deliverance. This false gospel of works is leading a vast religious system into spiritual deception. Enchanted by signs and lying wonders and riding the ecumenical bandwagon, the Latter Rain/ Manifest Sons of God will be easily assimilated into the Mystery Religion revival foretold in Revelation 17. II Thessalonians 2:10-11 describes God’s judgment, which has already begun in this movement: "…because they received not the love of the truth, that they might be saved. And for this cause God shall send them strong delusion, that they should believe a lie." Yet, I was wounded by the archers, spent.